The Villa Averoff, a 19th century historic property, on the Greek island of Evia, one of the most beautiful and unspoilt regions of Greece, a two hour drive from Athens. Ideal for family vacations or retreats of any kind, Villa Averoff offers to its guests relaxed and private vacations in an refined environment, located in the North of Evia, a region with amazing landscapes and beautiful beaches. Set on the outskirts of a village, facing the church and the old stables, the Villa consists of two large traditional properties set in terraced gardens with a large swimming pool. - The first property, called 'Red house', is a two level mansion that accommodates 10 people in 5 bedrooms, 2 of which look on to the balcony with a beautiful garden view. Each bedroom has a unique character. - The other property, called 'White house', also accommodates 10 persons in 5 bedrooms. 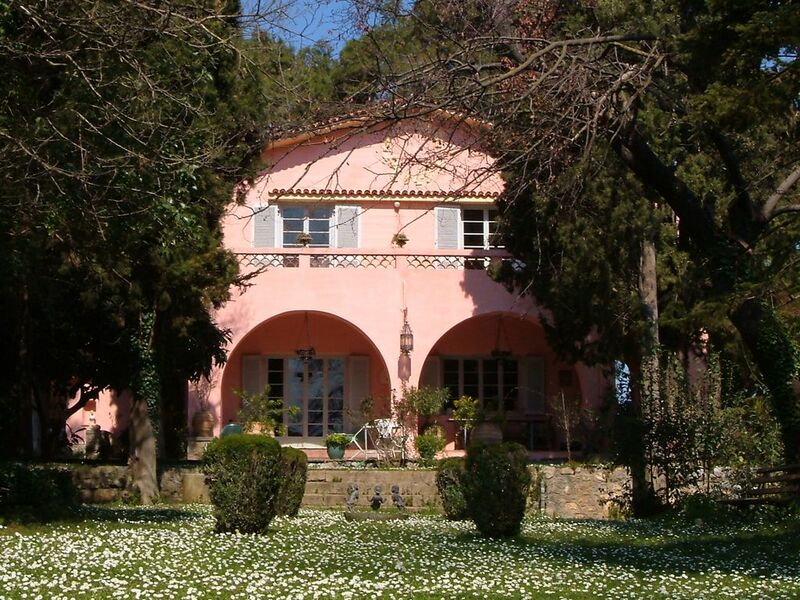 It is an elegant family house with its private garden and patio surrounded by arcades. There are also 5 separate rooms and a studio that can be rented with the White House. The "Hayati" rooms and the "Guest House", accommodating 14 people in total, each room with its private bathroom. The Hayati and the Guesthouse are only rented together with the White House. Each of the houses have their own character and charm. They can be rented separately or together as they only share the crystal-clear swimming pool. Only a two hour drive from Athens, The Villa Averoff is a perfect place for those wishing to holiday in a refined atmosphere and discover one of the most beautiful and unspoilt regions of Greece. The 100sm hall can host yoga classes or any other group practice, during summer or winter months. A small animal farm was added recently to the property, providing interactive fun with farm animals such as goats, sheep, dears & rabbits enabling guests of all ages, especially children, to interact the animals. I have spent my childhood years in Paris, France. I moved in Athens, Greece as a teenager and later on, in 2005, I have decided to move to the island of Evia, take over the property of my grandparents and restore it in a way that it doesn't lose its authenticity and character. I will be more than happy to welcome you in our special family estate. The Villa Averoff, a historic estate, was owned by the Averoff family since my ancestor Avgerinos Averoff, a nobleman from Northern Greece, bought the land in 1833, when the island of Evia was liberated from the Ottoman occupation. Today, the Villa Averoff, has opened its gates to guests for a unique accommodation experience, in one of the two beautiful mansions of the estate: the Red House and the White House. Unique benefits of the property: An elegant and unpretentious estate that offers a unique experience to visitors, as it holds its character and atmosphere from the olden days. Combing simplicity with style, it can provide a relaxed and "away from it all" vacation time to its guests. Its magnificent garden and small animal farm makes it perfect for children. Unique benefits of the area: Beautiful beaches and wonderful nature, rivers, canyons and unimaginable greenery, a natural environment that offers plenty of alternatives to visitors all year round. The bathroom on the ground floor and the Master bedroom bathroom are ensuite. Service is very friendly. The owners, always available, are devoted to creating an environment that adds to your well being. In the evening it is possible to have a traditional Greek dinner and to enjoy the authentic flavours of Eubean cuisine, but make sure to ask for it in advance. The Villa Averoff is set on the outskirts of a village of Kirinthos, which provides all basic shopping needs and tavernas. You will find slightly more sophisticated shops, a post office, banks as well as a pharmacy and a health center in the town of Mandoudi, 5 minutes away by car. During summer the house is very cool due to the thickness of the walls. The house is a really good size, with beautiful gardens, lovely pool and close to amazing scenery. The hosts are extremely kind and helpful, and there are lovely walks and beaches close by. Supermarket is 5 minutes drive, and local bakery and convenience stores for other items. We would highly recommend it for a family holiday - plenty of beds and bathrooms, and close to a beautiful beach. House reasonably well equipped, comfortable beds and nice rooms - not luxurious but comfortable, and beautiful place to eat outside or just sit and read in the shade. An amazing discovery, so close to Athens! My family and friends have visited Villa Averoff in the summer of 2013. We were amazed by the beauty of North Evia, surely one of the most beautiful destinations in Greece that we have ever been. Unimaginable natural beauty for all tastes (forests, rivers and lakes, sandy beaches, crystal waters). The location of the Villa is ideal: in the edge of a small village, surrounded by beautiful mountains and at the same time it is only 5km away from a wild sandy beach. Staying at Villa Averoff we had the chance to enjoy private, stylish and unforgettable vacations. We were amazed by the elegant historic houses, filled with antiquities that transferred us into another time. We were also amazed by the magnificent gardens and the beautiful swimming pool, that offered us moments of relaxation and tranquility -we had a hard time leaving the place! The hospitality of the owner and staff was more than we could wish for. It has been overall a great choice which we would recommend without any reservation! Thirteen physicians and scientists from our Research Divison spent five days in Villa Averoff for a scientific seminar. We had talks during the day, and went on outings to the beach in the evening, to the pictoresque sea-side town of Limni (30 minutes), or just relaxed by the clear water pool. We were warmly welcomed by the owner of the property and his friendly crew. We had delicious home-cooked greek dinners in the stately dining room of the property. Clean, spacious rooms with artistic furniture. We look forward to come again. It was a pleasure to host such a scientific seminar, wonderful people! The Villa Averoff is situated in the North of the island of Evia, 2 hours away from Athens by car (nowadays the island is linked to the mainland with a suspension bridge). Set in the outskirts of a village in the valley of the river Cereus, the Villa Averoff is surrounded by verdant mountains and close to a beach that is part of Greek Mythology. The region is of immense natural beauty that combines beautiful beaches, mountains, hills, rivers, olive groves and fertile valleys. First class holiday destination, there is something of interest to be seen at every turn in North Evia, where modern life thrives alongside splendidly preserved culture and tradition. The region is a perfect for a vacation, offering both a relaxing and peaceful atmosphere and easy access to a wide range of sights and activities nearby. NEW!!! A ferry connection every two days, 4km from the Villa Averoff, will bring you to the Sporades islands, ie. Skiathos, Skopelos and Alonissos.